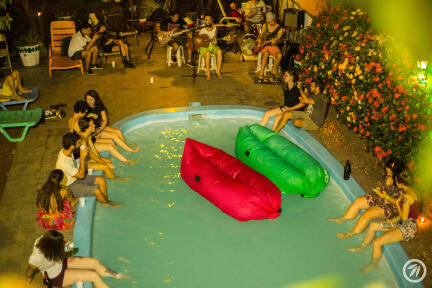 Green House Hostel & Camping i Foz do Iguacu, Brasilien : Boka nu! Our main goal at our hostels is connect you to the city and the local. That´s why we are offering 2 departures per day to the waterfalls brasilian side for free(one way, from the hostel to the falls). Besides this we have a knowlageble staff always ready to give you the best tips and talk to you about some other trips to show you some local spots besides the waterfalls, so let´s experience Iguassu? The hostel have the best location you could ask,being located in downtown we are 7 min from the bus stop directly on the bus line that connects you to the Brazil side of the waterfalls, the famous Bird Park, Itaipu Dam, the Budhist temple and many other exciting things to see as well as easy access to the airport and bus terminal. If you are thinking about visiting the Argentina side of the waterfalls, you don´t need to spend a nitgh at that side, we have the most easy way to do it. A daily Argentina Falls Full-Day trip that run 7 days a week and includes round trip transfer, entrance fee, guide and visit to the 3 landmark(the easiest way of doing it for the most reasanable price). At a walking distance from the hostel you will find various bars, restaurants that you can get discounts as being our guest! A large supermarket is located just a few blocks away and our kitchen is always open to use for all of our guests.